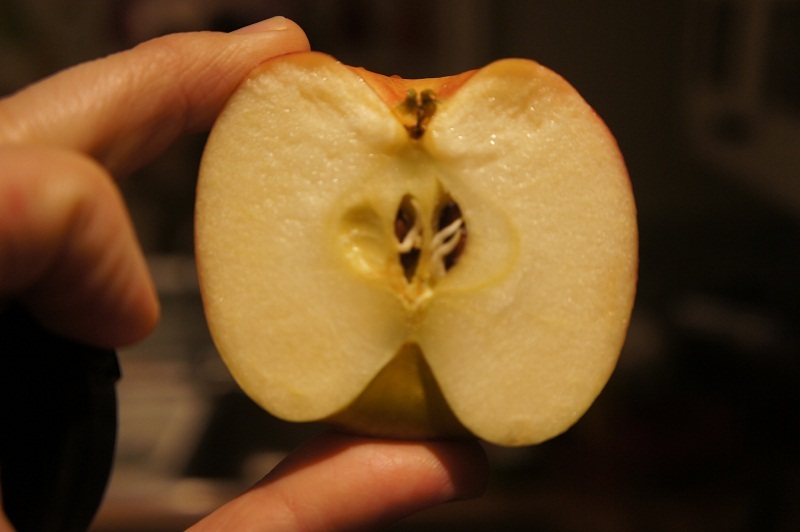 I never knew Pink Ladies could actually germinate before being opened up. But apparently they can. And several from this pack (from a well known Giraffe-bread-stocking supermarket) had already grown a number of little shoots of this size on being cut open. Wow! 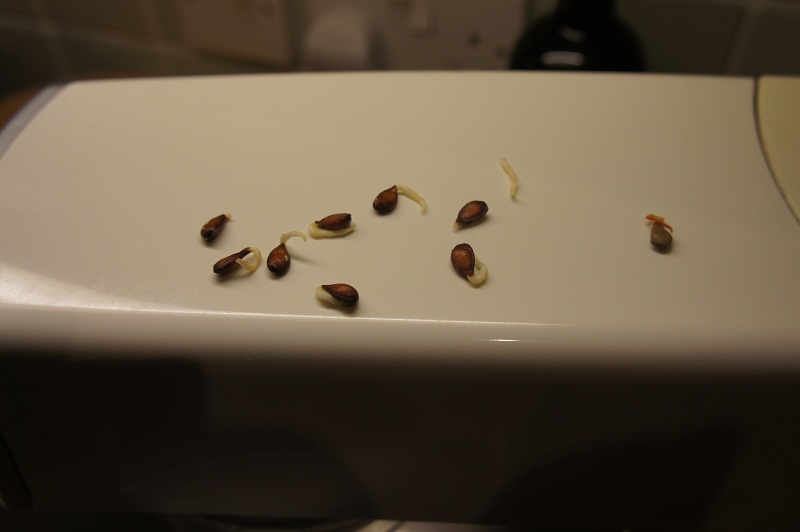 So, like any good parent, I saw fit to give the fruit to the children to eat and duly ‘planted’ the sprouting pips on some damp kitchen roll in a jam jar. Now I have to wait and see whether we are in for an orchard. How exciting. We already have extra growth, some green. Do you like stories that restore your faith in humanity? For example, collections like this at Buzzfeed? Number 7 was familiar to me and perhaps to you too. It is odd finding new references to the letter my daughter Lily painstakingly typed over a year ago. I have to concede though, the Giraffe Bread story did turn out to have many ingredients of a great meme and we do get spikes on the blog here as the story breaks in new arenas and languages. Tumblr fell prey not long ago. It is odd seeing how people like passing on a story they like in waves. The story of the letters went viral on Twitter last year (thanks to a university friend tweeting images from this blog) and then on Facebook in January, care of a chap in Singapore called Parker Lim who I do not know. Many people started making comments that the bread should be renamed, but I had nothing to do with this. 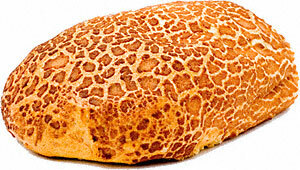 Sainsbury’s called me up shortly after and told me they had decided to change the name from Tiger to Giraffe Bread. It is still selling as Giraffe Bread in shops and is a huge PR success for them. Newspapers and radio stations started reporting the story, but we are far more impressed by the reporting skills of the general public than the newspaper journalists, many of whom clearly didn’t check the facts. For Lily’s sake as she gets older, we have printed out international copies of the story we have found and other positive reactions we liked. We have not wanted media coverage, and would far rather deflect the story’s attention toward helping others. I am also aware of trolling on the topic and am keen that Lily is protected going forward from hurtful sites. As a result, we are making very little of the story around her, other than making a point of visiting Lili the Adopted Giraffe at the zoo, and enjoying playing with some Active Kids equipment that Sainsbury’s sent to her toddler group at church. 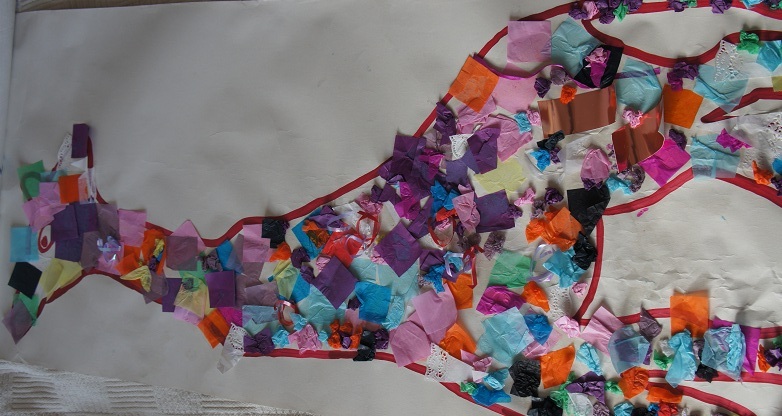 The toddlers made a giraffe collage to send to thank the kind people at Sainsbury’s too. Pretty good I thought! I have to be honest and say that despite the human race’s propensity to stupidity and evil, most people want to hear good things most of the time, rather than negative things. We crave hope. We delight in success. We want stories that are punchy and positive. And so Giraffe Bread is not going away any time soon. I have realised that it is likely to be revisited in new waves from time to time, and if this brings joy and hope, wonderful. If it also prompts some to click on our link to help feed children in Africa, even better. I don’t always feel the need to revisit the Giraffe Bread story, but since the good folk at WordPress have kindly started collecting data on where in the world people are looking at my blog, I thought this might be interesting to some readers. This data is only since 25th February (the story broke at the end of January, so most of the hits were in the first week of February, and won’t be registered here). Wow. Thank you for stopping by, world. One day Lily said ‘Beaky died on his birthday’ and we asked how. ‘Beaky had a party and he died and now I have a new dog called Chadderly’. ‘No’ explained Lily, ‘Chadderly, from the London Advent Calendar‘. This did not make enough sense to us, so we asked about Chadderly. What did he look like? Lily then had to tell Beaky and Chadderly off for jumping on the furniture, despite neither of them existing and one having apparently passed away, which brought that conversation to an end. 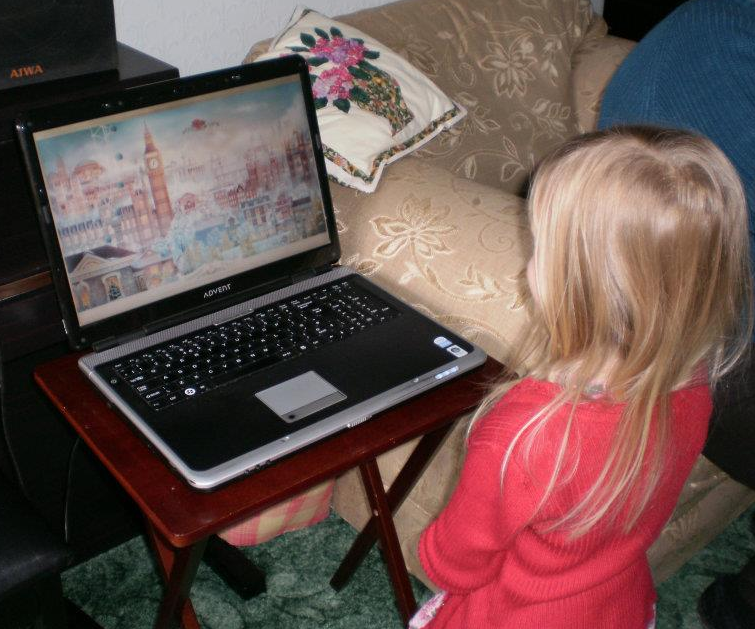 The next time we visited Grandma and Grandad’s house Lily wanted to see Chadderly on their London Advent Calendar. It is not putting it too strongly to say that Lily is obsessed with the London Advent Calendar. She can tell you what most of the dates do and every day of the month she reminds you of the equivalent last December. The London Eye is the 3rd. The Restaurant with the scary silhouettes is on the 5th and therefore will be ok to watch when she is 5. Big Ben is on the 1st. The Three Boats Come Sailing In is on the 6th. There are a number of others, as you might imagine. Lily makes up songs about it. She talks about the animals. She tells stories about them. She has decided that her teddy Archie will go to the St Paul’s Cathedral school and church (17th). 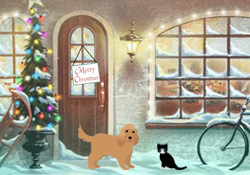 She looks forward to going to Grandma and Grandad’s house mainly to play with their London Advent Calendar. Here she was at Christmas getting a big fix, in my absence. I don’t know when you last mixed chocolate and vanilla ice cream, but I recommend it. It does not, however, come out black. This is Bertie. So, goodbye Chadderly and goodbye Beaky. We will not ever never forget you. And welcome to the madhouse Bertie from the London Advent Calendar. 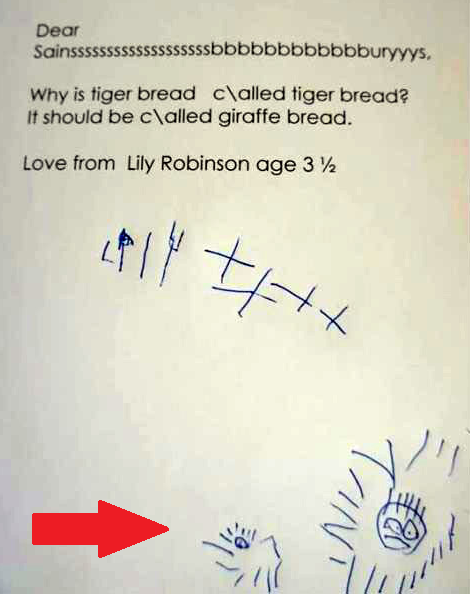 We are grateful for the massive interest in Lily’s Giraffe Bread letter as a result of the new viral impact this week and Sainsbury’s launch of Giraffe Bread earlier today. We are not making personal profit from this story, but if it has touched you and you are considering buying some real Giraffe Bread (real Giraffes not included), please also consider making a small donation to the Disasters Emergency Committee, so that more children can eat. 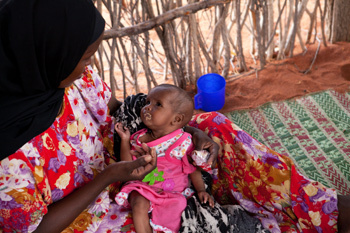 So many children, particularly in East Africa, are right now facing another day with no food. Let’s make this a real good news story. You could do it right now through Paypal and quote the DEC email address to donate: donations@dec.org.uk. Update 1st Feb I have discovered today that DEC’s East Africa Appeal has just closed, so you can no longer text the word DEC to 70000 to donate £5. But you can still donate towards their appeal for future emergencies, or you could give to the work in East Africa by donating to one of their member charities feeding people there right now, such as Tear Fund. Thank you for taking an interest, and thank you for making a difference. This has all got very silly. I still find it funny that people are forwarding and promoting this story in all kinds of ways. It divides people into several responses. 1) There is no way a child that age could do that. 3) Chris King is a hero who should be knighted/promoted/extolled beyond even twitter and facebook. He seems a top bloke. 4) What a great PR strategy this appears to have been (we wish our company had thought of it). 5) What is a £? 6) How mean that Sainsbury’s should only send a £3 voucher. 7) How kind of Sainsbury’s to send a £3 voucher. 8) What is £3 in dollars/euros/baht? 10) Where can I get a Sainsbury’s? Next time I am in the United Kingdom I want to buy one. 11) What is tiger bread? 12) If there are no giraffes in it, we cannot call it giraffe bread, under EU trading directive. The Huffington Post (UK) believe Sainsbury’s ought to rename it Giraffe Bread. My father believes they should sponsor a Giraffe in a wildlife sanctuary or zoo, preferably called Lily. Wikipedia briefly mentioned the story (under Tiger Bread), but the story apparently needs verifying. A number of other blogs around the world have written up the story now, mostly in the heart-warming category, but an Italian Magazine has capitalised on the marketing side too. The Sun now has a page on the internet also telling the story: Little Lily probes Sainsburys about tiger bread and I was obliged to spend 30p checking whether she was in print today (no, just online). Facebook has a page dedicated to hero-worshipping Chris King, gaining huge popularity today. From this I have learnt today that Chris, like Lily, is about to start nursery school, on placement as a trainee teacher. He will make a great teacher in my opinion if he is a natural at getting on to the children’s level. 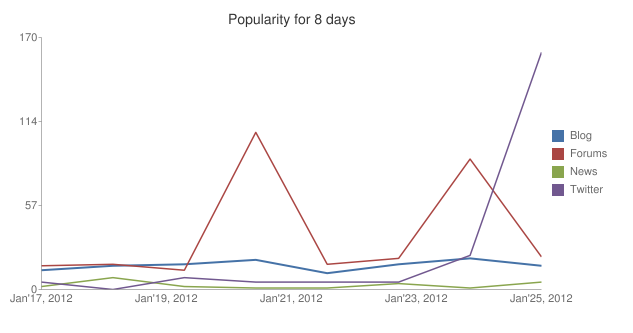 Perhaps the most bizarre twist is the analysis done by Laurence Borel which tries to trace how the story went viral. My friend from university who originally posted the pictures to Twitter makes some insightful comments at the end of that analysis. Facebook couldn’t forward photos in quite the same way as Twitter back in June. … which won’t be happening on my watch. £3 is quite enough really to make a whole lot of people smile.